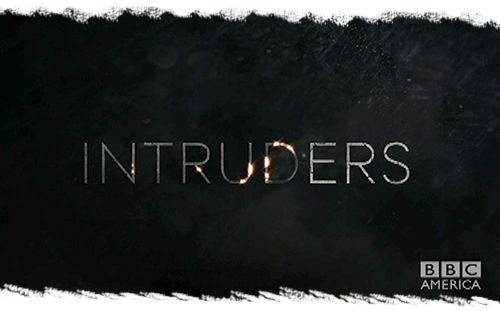 As I wrapped Da Vinci’s Demons Season Two last spring, my friends at BBC Worldwide Production / Adjacent Productions began talking to me about their newest scripted series, Intruders. 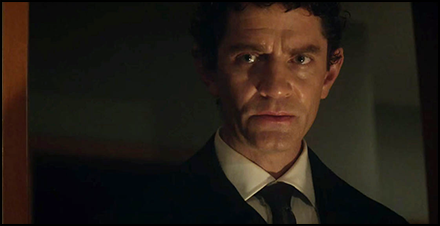 I learned the show was a supernatural horror thriller for BBC America, based on Michael Marshall Smith’s 2007 novel The Intruders, boasting a remarkable cast including John Simm, James Frain and Mira Sorvino. I was most intrigued, however, when I learned that the show was written and produced by veteran producer Glen Morgan. All of this combined into a project that was truly irresistible, and I signed on. 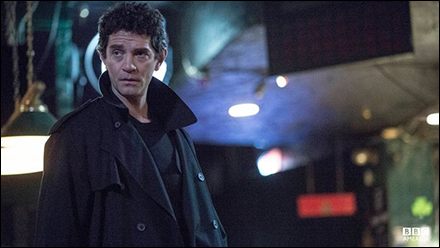 The eight-episode first season is now drawing to a close, with the gut-wrenching finale airing this Saturday night on BBC America. 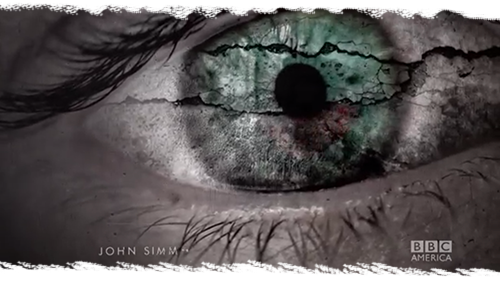 This was a fascinating starting place for a contemporary supernatural thriller. I adore acoustic music, performed by intimate live instruments, and knew well every score Glen brought up. I loved the idea of using solo piano as the primary driving force my Intruders score. In fact, I made it a goal to score Intruders with nothing but solo piano. We went into the studio of Doug Lacy, the mad piano genius my fans may recognize from my memorable video blog showcasing pianos for Black Sails. In that Black Sails session, Doug was struggling to hold a dying piano together and keep in tune while I played it aggressively. For Intruders, we pushed it the other way: we destroyed the piano and recorded the entire process! The piano shell you see being carted into the studio at the beginning of the video was damaged in a house fire. Thankfully, no one was injured, but the house was destroyed and, within it, the grand piano was engulfed in flames and debris. Quite miraculously, the soundboard never melted and the strings didn’t break, so the burnt husk still resonated beautifully. I told Sam the kind of percussive bows, scrapes, hits and smashes I was hoping for, and he spent days in the sweltering garage, sampling every tick, crack, smash, clunk and snap he possibly could. These sounds were then assembled into digital instruments that I used to compose. The sounds are terrifying, exhilarating and mysterious, creating all the moods I would require to tell the complex and layered story of Intruders. Best of all, they all technically came from a solo piano, thus paying homage to the 1970′s thrillers Glen and I discussed, though in perhaps the most ironic way possible. Glen asked for solo piano, so I took a sledgehammer to one! Setting out to compose Intruders was a thrilling experience. I had a wholly new template of incredible sounds to inspire me. I typically write in an expansive template, and here, I just had a handful of powerful sounds. I found inspiration within these bizarre constraints. 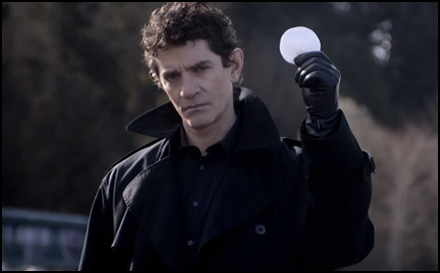 Intruders is about a secret society, Qui Reverti, who have learned the secret to reincarnation. The problem is that to return to this world after death, they must take over an innocent person’s body. 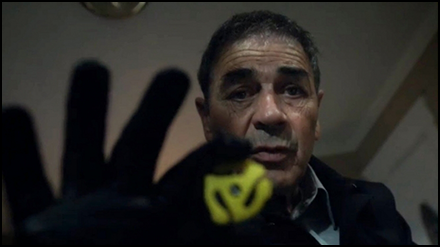 Our story centers around a retired cop named Jack, who loses his wife Amy to an unwanted spirit. 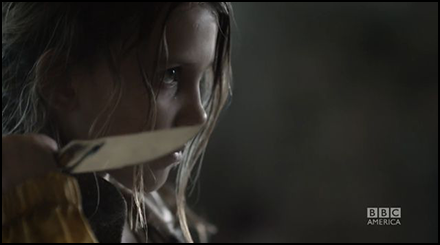 At the same time, one of the Qui Reverti members, Shepherd, pursues a little girl named Madison, whose mind houses the spirit of a psychopath named Marcus Fox, for reasons that become increasingly clear as the series progresses. The stories of Jack and Amy, Shepherd and Madison, intertwine in fascinating ways, building up to the stunning finale. I felt strongly that character themes would be necessary to help navigate the audience through the narrative, and Glen agreed. I dove headfirst into the challenge and created unique character themes for each primary character. You will first hear this, in its most pleasant variation, in the beginning of the first episode, when we meet Jack buying a cake for his wife’s birthday. This theme will never sound so innocent again. Their relationship is strained, bit by bit, with each subsequent scene, building to heartbreakingly dramatic sequences. I use echoing refrains of the Jack and Amy Theme to remind us of Jack’s goal: he is trying to find his wife and win her back from the spirit overtaking her. So, it was essential that the audience get a glimpse of their theme in a positive light at the beginning of the series. The memory of this theme will haunt us throughout the rest of the season, because Jack gets further and further from his goal the more he struggles to get closer. Their theme becomes increasingly ambient, washy and distorted in the process. The Shepherd Theme stands in opposition to Jack’s. The Shepherd Theme is a low, rumbling ominous descending minor second, created by bowing the lowest strings of the fire piano. The theme is used prominently to underscore the menace of Richard Shepherd as he slithers through the night, leaving a trail of bodies in his wake. Interesting things occur with his theme as the series progresses. There comes a point when we learn what drives Shepherd, and what threatens him. In those moments, I still use his signature two notes, but I make them thinner and more vulnerable. The Shepherd Theme is only two notes, arguably the smallest number of notes one could write that could qualify as a theme at all. However, the grating bowed piano sounds make it very effective, and hopefully iconic of the character. The series’ other primary antagonist is the ghost of Marcus Fox, inhabiting young Madison. Madison always struggles to keep Marcus suppressed in her subconscious, and he increasingly takes control of her body. I knew immediately a signature musical theme would be a useful tool to help tell the audience when this occurs. You know The Marcus Theme when you hear it. A mallet striking the fire piano’s soundboard created a collection of two repeated notes, followed by two more, lower by a detuned interval, and then a repeat of the first two notes. Often times, these six notes form background patterns upon which the score evolves more dynamic emotions. We always know, however, that the presence of this sound signifies that Marcus is in control. There are scenes where Millie portrays Marcus pretending to be Madison! Here, the theme is incredibly useful for the audience, because it assures us that Marcus is trying to behave like a little girl to manipulate people around him. It is a testament to Millie’s astonishing acting range that I can keep these musical indicators so subtle and supportive, because she brings these two characters to life seemingly effortlessly. 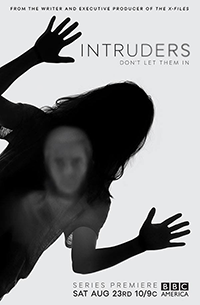 Intruders has no singular protagonist, so I didn’t want to play favorites and have any one character theme function as the series’ Main Theme. I composed a unique melody for the chilling title sequence, one that has no direct connection to any single character. 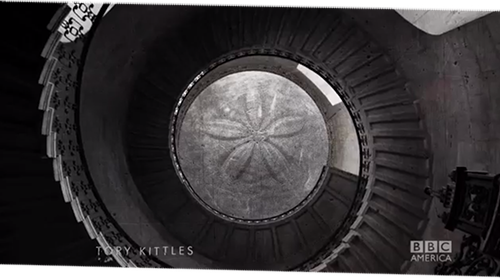 I must take a moment and say how much I love the visual design of this title sequence. This marks my second collaboration with Paul McDonnell and Huge Designs, after our double-Emmy-winning collaboration on Da Vinci’s Demons. For Da Vinci, I sent Paul and his team a music track and they animated to it. For Intruders, we worked the other way around. I took one look at their visuals and immediately began hearing music, fitting my music to their gorgeous, evocative imagery. I have always admired producer Glen Morgan’s work, starting with his stunning run of episodes on The X-Files. He had worked with composer Shirley Walker on a number of projects over the years, including the last film she composed before her untimely death in 2006. Shirley’s music has always been hugely influential on my own (See my older blogs Battlestar Galactica “Dirty Hands” and The Cape). In chatting with Glen, I recalled I witnessed him speak at Shirley’s memorial back in 2007, years before we would ever eventually meet and work together. I was excited to score Intruders so I could work with Glen and ask him for first-hand stories of working with one of my musical heroes. I was pretty direct about this, asking Glen about Shirley within the first five minutes of our first conversation, before I was even officially working on his show. “On our first call, I was caught off guard when you asked me about working with Shirley, but I thought, ‘Alright, this guy is going to be okay with me!’” Glen told me recently. ‘I think it lies in this… the last words she ever said to me, on a cold October parking lot, ‘I like when you and Jim Wong write about heroes. Let’s do more of that.’ And so, from ‘Galactica’ to ‘Da Vinci,’ ‘Outlander’ to ‘S.H.I.E.L.D.’ and little Madison O’Donnell, you write music for all types of heroes. That… is one of the many reasons I loved scoring Intruders. 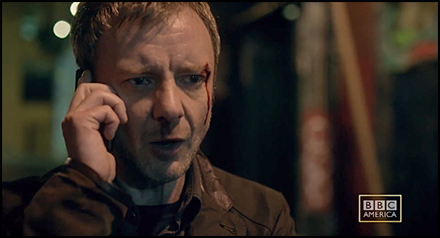 The gripping season finale of Intruders airs this Saturday on BBC America. There are many places to binge-watch and catch up. I apologize to piano purists out there for destroying pianos in the name of art, and I apologize to anyone who, like my wife, gets nightmares after watching this show too late at night! As always, thank you for reading and listening.